who took top honours in this year’s competition! the NFFD Winners page, along with judges’ comments. All sixteen long-listed stories from this year’s competition will be published in a special winter edition of Flash Frontier: An Adventure in Short Fiction. Special thanks to Owen Marshall and Fiona Kidman for so generously sharing their time and wisdom. 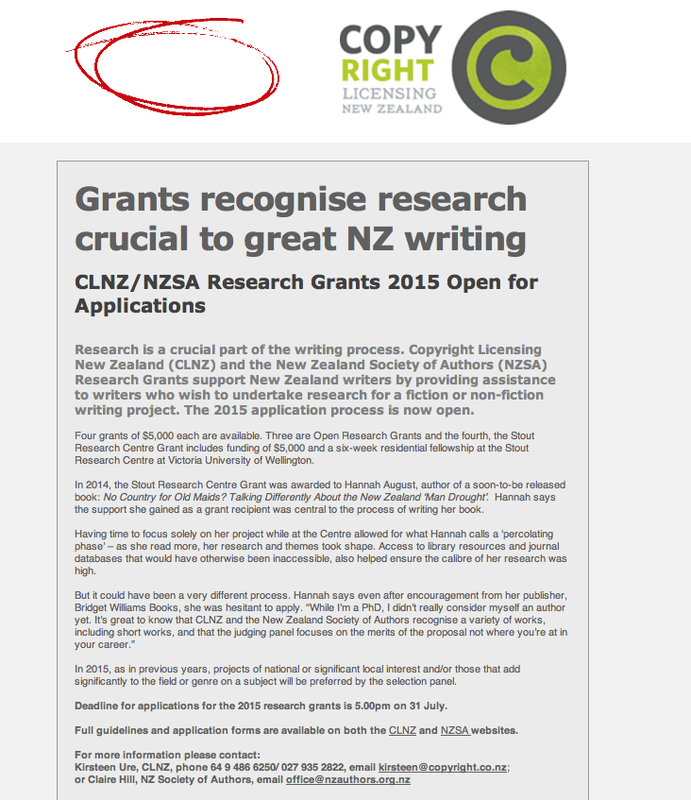 Thanks to the NZ Society of Authors branches who support the Regional Awards. A great deal of individual effort has gone into organising the gifts and awards that the branches donate, and it’s thanks to branch chairs and members that this part of NFFD is a growing success. Thanks to Designlab in Auckland for our logo and banner images. We’re handsome and shiny because of you! Thanks to the bookshops around NZ who support our efforts — Jason Books in Auckland, Unity Books in Wellington, University Bookshop in Dunedinand Scorpio Books in Christchurch. And thanks, finally but hugely, to our event organisers, volunteers, proxy readers and MCs — NFFD would be nothing without you! Here’s to this year’s success, and to you! This entry was posted in Uncategorized on June 25, 2015 by Paula Green. 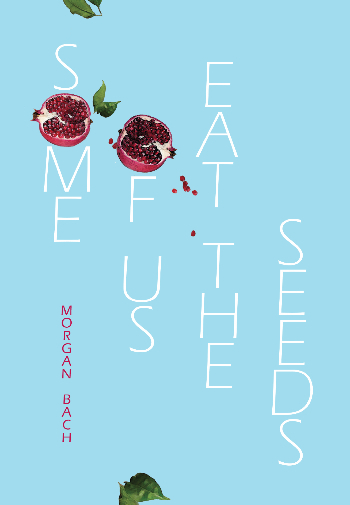 Morgan Bach weaves a line between waking life and the unstable dreamworld beneath, disorienting and reorienting us from moment to moment. In poems of childhood, family, travel and relationships, she responds to the ache and sometimes horror of life in a voice that is restless and witty, bold and sharp-edged. This entry was posted in NZ poetry, NZ poetry book, NZ Poetry reading, NZ Poets, Poetry Events, Wellington poetry reading and tagged Morgan Bach, VUP on June 24, 2015 by Paula Green. Great to see this award go to Karlo Mila. Congratulations. 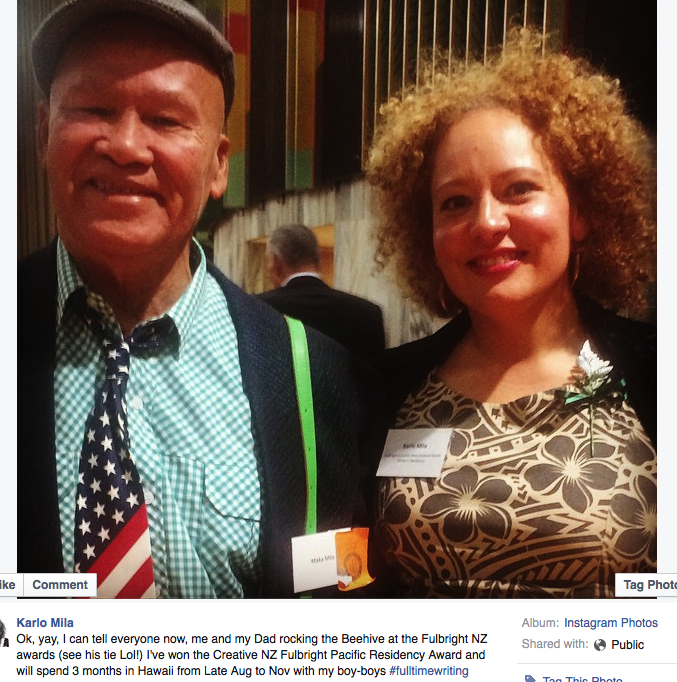 This entry was posted in NZ poetry, NZ poetry event, Poetry Awards and tagged Karlo Mila on June 23, 2015 by Paula Green. 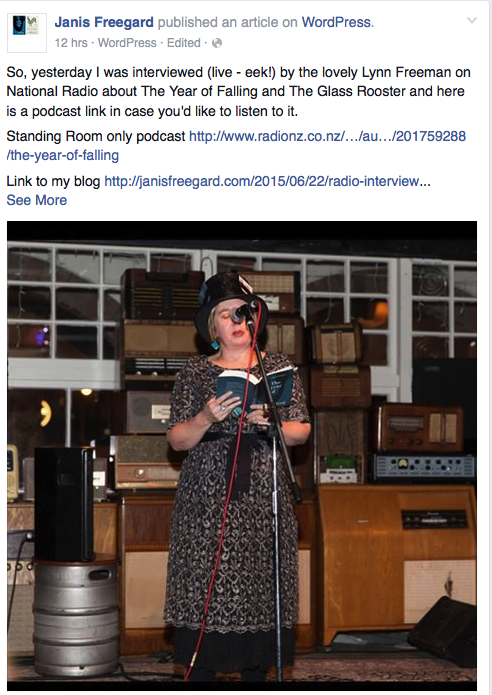 This entry was posted in NZ poetry, NZ poetry event, nz poetry review, NZ Poets and tagged Janis Freegard on June 23, 2015 by Paula Green. The British poet Simon Armitage has seen off an international field to be chosen as Oxford’s latest professor of poetry. Speaking to the Guardian after the announcement, Armitage said he was “delighted and very excited and suitably daunted as well”. He said he would try to give students an insight into “what is occasionally quite a muddy world, and a muddy art form, remembering that the audience are primarily students, and not to see it as a platform for professorial grandstanding”. The award-winning author of more than 12 collections of poetry, Armitage has been hailed by fellow poet Sean O’Brien as “the first poet of serious artistic intent since Philip Larkin to have achieved popularity”. Combining linguistic inventiveness, streetwise flair and contemporary subjects, he has reached an audience far beyond the literary ghetto with poems, novels, translations of medieval verse and scripts for radio and television. The poet laureate, Carol Ann Duffy, welcomed the announcement, calling Armitage “a fine, vocational poet and a brilliant communicator for the modern age who never forgets the roots and ancestry of poetry”. This entry was posted in Uncategorized on June 23, 2015 by Paula Green. This entry was posted in Uncategorized on June 22, 2015 by Paula Green. I am delighted to see the Parsons Family honoured at these awards. The Auckland store under the guidance of Helen used to stock the best selection of NZ poetry in a room devoted entirely to NZ books. Bravo Roger and Helen, booksellers extraordinaire. This year the award was presented to the Parsons Family of Auckland and Wellington for the inter-generational contribution the family have made to the industry. All of the winners of the Book Trade Industry Awards this year have been applauded by the judges for their dedication to quality – whether in publication, selling, or running events – and passion for the trade. There were six awards given, and for the first time this year, applicants were invited to self-nominate. This allowed some smaller bookstores who didn’t frequently see publishing reps to highlight their own efforts to improve sales for their stores. There was a large number of nominees in this category, making the prize even more desirable. The judges of the awards were Karen Ferns, Jill Rawnsley, Carolyn Morgan, Graham Beattie and Karren Beanland. ‘Jenna manages the shop, which had its best ever sales in 2014, in an exemplary manner. Not only does she run their media & social media effectively, the customer testimonials for her work were outstanding,’ said judge Karen Ferns. ‘Tammy is tireless in seeking ways to inspire customers, and has shown great leadership and resilience in facing head-on, with those customers, the challenges of the past year (or few),’ said judge Jill Rawnsley. ‘The winning marketing strategy for 2015 saw an impressive result for the publisher and Chelsea Winter, the author, whose input into the campaign is every bit as contributory to the results. It is a competitive area of publishing, but the team at PRH pulled it off beautifully,’ said Rawnsley. ‘Bridget Williams Books wins this for their innovative list, and how effectively they have embraced the new digital age. They have proven their commitment to quality non-fiction publishing, publishing the important Tangata Whenua, while launching their new imprint BWB Texts over 2014,’ said Morgan. ‘Potton and Burton show exceptional commitment to quality in its publishing programme, its production values, its relationships with customers and authors alike, and in the delivery of an essential distribution service. As well as this, the company’s dedication to New Zealand stories shines through in their regularly award-winning books,’ said Rawnsley. ‘Unity Books runs 50 events per year, and their support of NZ publishing accounts for 18% of their sales. Unity has proven over the years a great training place for aspiring booksellers. Overall, they win this award for their general excellence, and the special place they occupy in the community,’ said Morgan. The Book industry is well-served by the passionate booksellers and publishers that are continuing to inspire in a changing environment. The Book Industry Awards are sponsored by PANZ, Nielsen Book and Booksellers NZ, and were administered via Booksellers NZ, by the Book Trade Liasion Committee. This entry was posted in Uncategorized and tagged Parsons Books on June 22, 2015 by Paula Green.